Untied, Barangaroo — Truffle Pig. Untied is the one of the latest openings among the streets of Barangaroo. That said, the streets are hardly visible, when perched on level four in this open air oasis, the concrete jungle hardly noticeable against splashes of colour and tropical greenery. Untied is the latest release from the ever-growing portfolio of the Dixon Hospitality group - known for some of Sydney's favourites such as House of Crabs, Queenies and the famous Oxford Tavern. 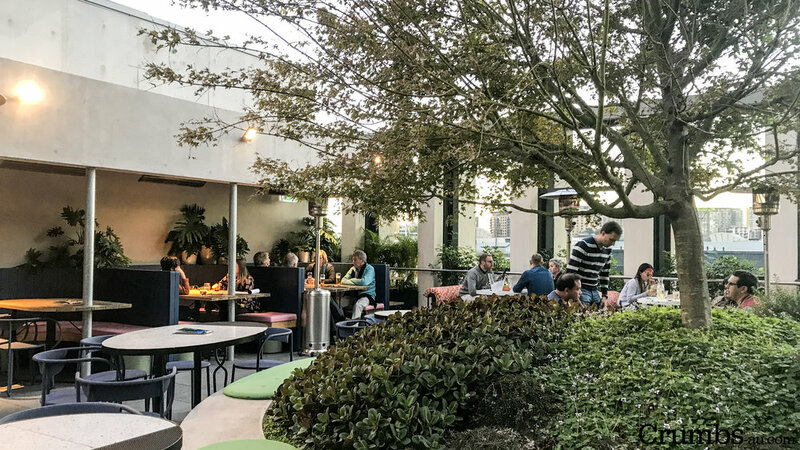 It only makes sense for the Melbourne based company to join in on what is seemingly an emerging trend of bringing Melbourne's roof-top scene up north to enjoy a warmer sunshine. Untied sports a fun and relaxed vibe. There's big yellow umbrellas, tall pastel terrace seating and bright, light timbers. Whilst it may retract from the vibe, astro turf wouldn't look out of place. The well stocked bar is draped with hanging greenery, and the gorgeous deep pastel hues sprawl inside a for some more refined vibes. The cocktail menu continues the feel. There's lots of fruits, citrus and tropicals. That said, the bartenders are of good stock and too easily can produce good product beyond the paper, including an incredibly smooth old fashioned, with or without the cherry, for those wanting a bit more kick in each sip. The Red Autumn is a soft starter, and the end result far different from expectations, especially considering all those serious ingredients listed out for the concoction. Its mild, not sweet nor boozy, and overall well balanced without any one particular flavour. Garnished with a burnt chamomile dust reminiscent of apple and cinnamon tones, it brings ingredients full circle into a mild and refreshing blend. A Little Chilli is a little more adventurous, yet not as fierce as one would expect. Not unlike the Red Autumn, its again well balanced, with no flavour dominance, resulting in an only slightly sweet, savoury style cocktail thanks to the fresh chilli and smoked salt. In terms of food, the menu is the most simple mixed bag of bar food. Clean cut flavours from the raw bar with the like of oysters or ocean trout, or your warmer & fried options such as croquettes, chips and fried chicken. The beef tartare is underwhelming in size for the raw-beef enthusiast, however the ingredient ratio result in even flavours and the spicy sauce brightens this up, softening any stigma from those new to this kind of dish. Bush pepper calamari, whilst not overly peppery, lives up to its larger sell. Its refreshing plate of savoury soft greens with tender strips of crisp calamari. Eat this one quickly and get to the calamari before the dressing does.